I hear the skepticism all the time. You know what I think, most businesses try Facebook Ads and fail to execute a strategy and then blame the platform. They fail to learn what their target audience wants, the behavior of the traffic on Facebook, and don’t have the patience to see the results. You know logically, this doesn’t make sense. 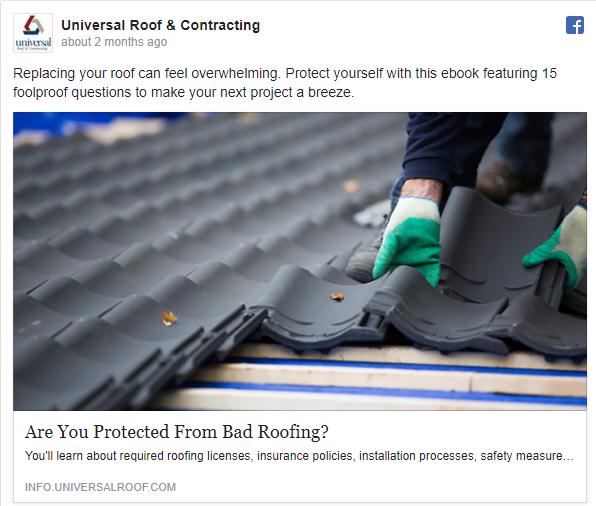 There are thousands of documented cases of local businesses succeeding with Facebook Ads, even in the roofing space. As a roofer, you have to remember that people are not going to buy a roof from someone on the internet. Facebook provides the perfect opportunity to create a value-first marketing campaign that can deliver remarkable results. In this article, I will provide a step-by-step guide for getting started on your first Facebook campaign. Facebook is huge. It has tremendous potential for a residential roofer. Advertising on Facebook has grown tremendously the last few years and a lot of businesses are killing it. 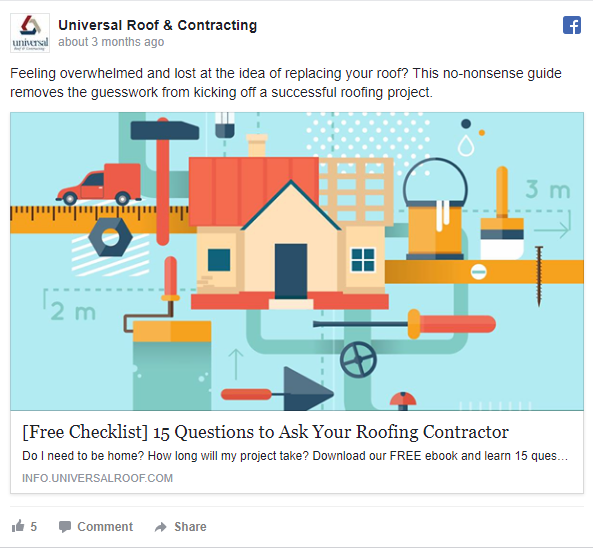 As a residential roofer, you would be doing your business a disservice if you ignore Facebook. Here are some mind blowing stats that will show you the size and scope of Facebook. Facebook Marketing is different than other channels. Facebook wants to protect its user experience no matter what. The users are the people who use Facebook as a place to hang out. As an advertiser, you have to adjust your approach and lead with an educational marketing strategy. No, they are looking to hang out, entertain themselves, and learn new information. A roof is not something most people would buy off the internet. It takes a relationship based approach to identify, qualify and then finally make a sale. A roof is a high-ticket product. In marketing, as a rule of thumb the higher price the product/service the more education is needed to make the sale. There are several advantages that Facebook has over Google AdWords. For one, the traffic on Facebook is cheaper than Google AdWords. You have more control on who you can target. Facebook’s creepy targeting options allow you to target almost anyone in the world. 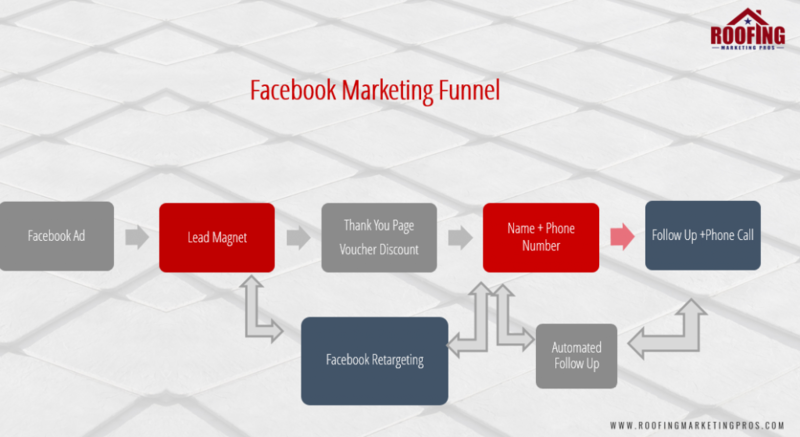 Creating a winning Facebook campaign is a little more complicated than an AdWords campaign. Unlike Google AdWords, the behavior of the traffic you will get is different. When it comes to the commercial side, I would use Facebook more as a supplemental strategy. If I have a database of email addresses, I would upload that database to Facebook and create a custom audience campaign. AdWords is still a much more effective strategy for commercial roofers than Facebook. Now, that you understand that Facebook is different than most marketing channels you have to lead with a value-first approach. What is a value-first approach? It’s simply about educating your prospects first by offering a piece of valuable content that can help them in deciding which roofer they might pick. Facebook marketing is interruption based marketing. This means you are interrupting people’s Newsfeeds with an advert. There are many different types of “lead magnets” you can create. I will go over some different types of lead magnets you can use. Infographics can provide awesome content in a visually appealing format. The best infographics understand the context of what the customer is shopping for. Infographics can be expensive to create. You can hire someone on Fiverr to create an Infographic or go to Upwork or even Dribble. Infographics should be seen as an investment. Even if you don’t succeed with your Facebook campaign a well-done infographic can provide valuable information to your prospects for years to come. An Ebook/report/guide has been used for years as a lead magnet for millions of different types businesses for a reason. They can provide valuable information and incite curiosity. The whole goal an Ebook is to create curiosity in your product/service. The fact is most Ebooks will not even be read by your prospects. The attention span of people online is less than a Goldfish so a lot of times they will even forget they downloaded the Ebook. A checklist/checklist work well. They provide the opportunity to give valuable specific information in a concise manner. They are also more likely to be read. As a roofer, you have to think what piece of information can you provide that will make you seem like an authority? Here’s what I would do if I was running a Facebook campaign. This will only work with residential roofing contractors. I got this strategy from Rick Mulready and Adam Sand in their podcast episode. On the thank you page, I would have a link to a calendar or an extra form with a compelling offer. A voucher discount would work well here. For the leads that opted in for the voucher discount, I would have someone on my team call right away. To maximize results, I would connect CallDrip to instantly connect the leads to my phone. Once you’ve figured out the targeting it’s time to turn on your Facebook Ads. 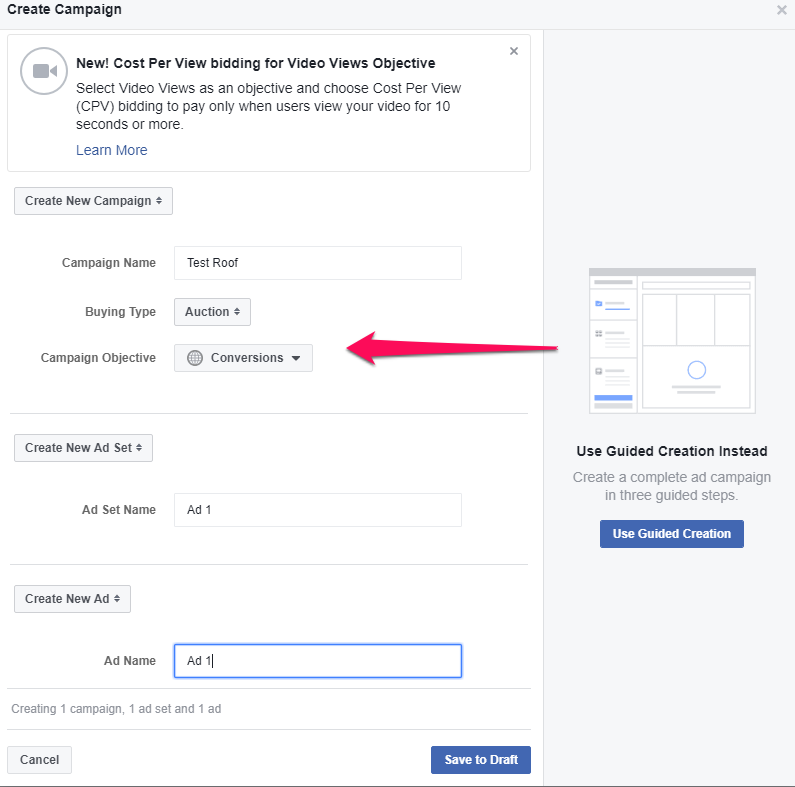 Here is the step by step instructions on creating a Facebook campaign. The key thing to making this campaign work will be the targeting. You have to get this part right or else your campaign will fail. You have to target people that are in the roof shopping phase. You can target all the homeowners in your city with Facebook targeting. You can even target by the home’s value. You can also target by demographics, interests, and net worth. For local campaigns, it’s always best to localize your ads. What I mean by that is you should call out the residents in your ads. Feeling overwhelmed with your roofing project? In this free checklist find out what questions you need to ask your contractor. Arm yourself with inside knowledge. Protect your house’s greatest investment. This type of ad would work a lot better on Google AdWords. When people search on Google they are looking for information. On Facebook, people are scrolling thru their Newsfeeds not looking for a roof. They want to check out what their friends and family members are talking about. They don’t care about their roofs. This is why it’s better to lead with a curiosity and value-first approach. A value-first approach will create desire. Our brain processes images much faster than text which makes the image the most important part of your ad. The image is the first thing people see when they are scrolling through their newsfeed. As a rule of thumb, your image has to be relevant to the rest of your ad. If your ad is not performing then the image is the first thing you would change. Once your prospect fills out his/her information they should be taken to a thank you page. On the thank you page I would make an offer. A voucher discount can work well here. Anybody that fills out the Voucher discount I would follow-up immediately with a phone call. According to Forbes, 71% of web leads are wasted because the follow-up is not done immediately. 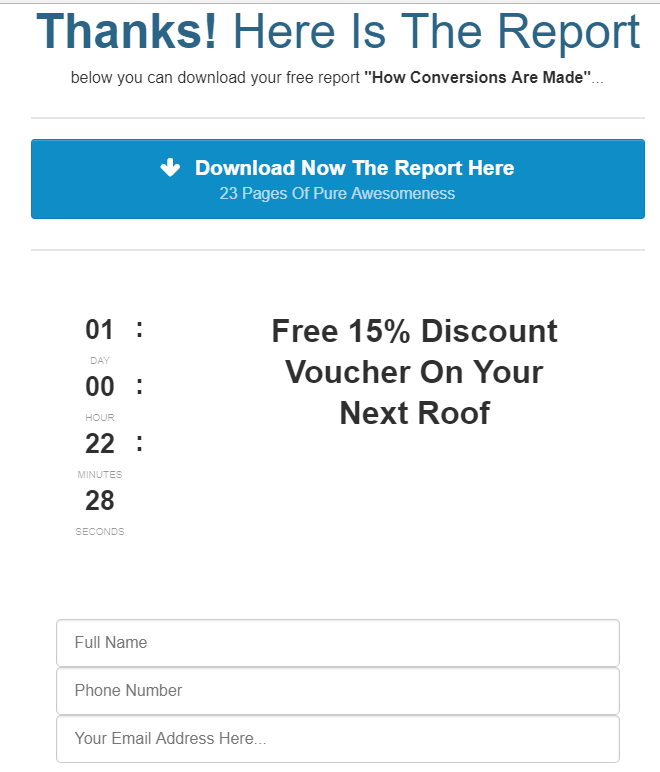 If your leads did not fill out the voucher discount form I would follow-up with the leads that only downloaded the lead magnet. The emails would be consist of educational content that provides value to the homeowner. 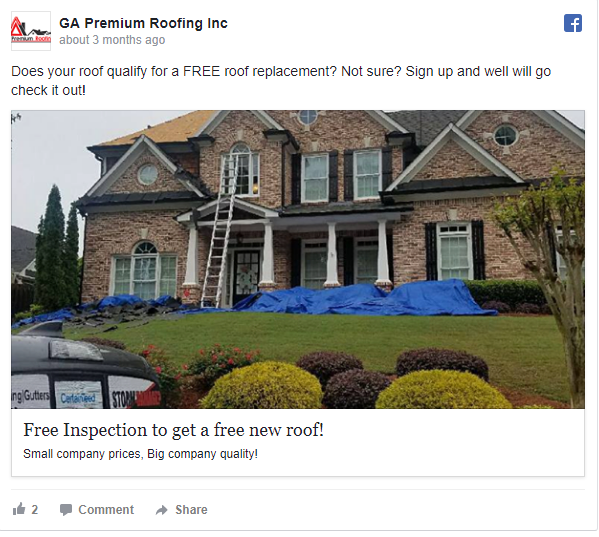 Facebook Ads are an incredibly powerful to promote your roofing business. There are several advantages that Facebook has over other platforms. You can target your ideal customer, build your authority, and generate leads for your business. Unlike a lead broker, a Facebook campaign will serve to promote your business locally and put you in control what you want to offer. What has your experience been with Facebook Ads? Have you tried for your business yet? You are right. Facebook is never to miss platform for advertisers. With over 2 billion active users and least CPC, it is the easiest platform to reach masses. Secondly, advertisement filters of Facebook allow advertisers to choose their target audiences by filtering gender, age, area etc. I run facebook ads on weekly basis and your suggestions always improve our ads. What landing page program are you using? Hi we use many different landing pages. Too bad targeting doesn’t work like this anymore with homeowners, etc. What’s your suggestions for finding this audience now that FB has removed these demographic options? Tired of ineffective Seo, which ends up being an expensive website that never ranks! I’ve been studying internet marketing, and I like GoMobile Solutions opinion that websites with multiple topics to click are worthless. They suggest a one page landing page. What’s your opinion?